Home > Testimonials > Retta is AMAZING!!! 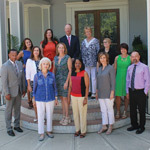 I did a lot of research on realtors in the Sumter area before choosing Retta and I am so glad I did. She is absolutely the best. Look no further, she is the one you want!! Retta is incredibly knowledgeable about the local area. We used her to buy our home. Based on our preferences, she worked tirelessly to find us exactly what we were looking for. We were new to Sumter so she helped to guide us through the neighborhoods and taught us about the local area. She found us the perfect home! Once we found it, she guided us through the buying process and made sure we were fully satisfied. I will definitely choose Retta again when it comes time for us to sell and would absolutely recommend her to anyone looking for an EXCELLENT REALTOR! !